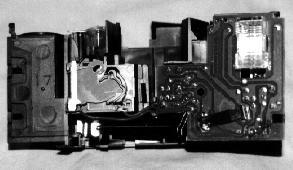 With the plastic view finder and front lens/casing removed, you can see the shutter internals and the solder side of the flash circuitry circuit board. CAUTION: The flash circuitry and the metal pieces of the shutter retain several hundred volts long after removing the battery. Press BACK in your browser to continue.